Join And You Creations on our Nature and You waterfall tour! Our experienced guides will lead you through the Manoa Valley Rainforest to a breathtaking 150-foot (45-meter) waterfall, Manoa Falls! The waterfall and its trail's location have been used in movies and television shows such as Jurassic Park and Lost. Enjoy the breathtaking and lush scenery of Hawaii while our experienced local guides share interesting Hawaiian cultural facts and history. Our tour includes pick up and drop off from Waikiki and a delicious and healthy lunch made with local and organic ingredients. The trail is suitable for people of all ages and experience levels at about 1.6 miles in length. Join us on this adventurous journey of self discovery! Join And You Creations on our Nature and You waterfall tour! 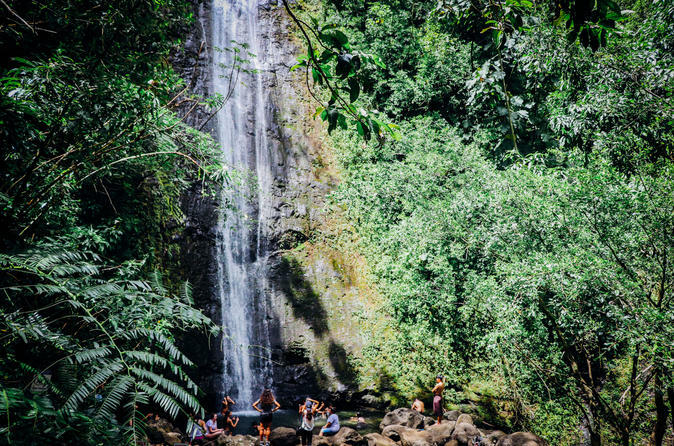 Our experienced local guides will lead you through the Manoa Valley Rainforest to a towering 150-foot (45-meter) waterfall, Manoa Falls! This waterfall and its trail's location have been used in movies and television shows such as Jurassic Park and Lost. The trail is suitable for people of all ages and experience levels at about 1.6 miles in length. With transportation from Waikiki included, our hike begins at a trailhead in the middle of the island, surrounded by massive jungle trees and stunning colorful plant life. The entire trail is an experience. There are many hidden secrets and treasures to behold along the way, such as a bamboo forest and a natural tree arch. Enjoy the breathtaking and lush scenery of Hawaii while our guides share interesting Hawaiian cultural facts and history. Ask them to tell you the story of the mysterious Menehune, or ancient Hawaiian ‘elves’. See if you can spot them in the trees! And listen for the calls of native Hawaiian birds - some found nowhere else on earth. The trail can be somewhat muddy (it is a rainforest, after all), so be sure to bring comfortable shoes and a light jacket. At the end of this 45-minute hike, the trees clear to display the “valley of rainbows” and your reward: 150 feet of cascading fresh water! Bring a camera to capture the beauty for yourself. It’s all downhill from there, as you head back along the trail the way you came. Take the time to revisit your favorite sights along the trail and ask your guides any questions you might have. After the hike, you will have worked up an appetite. We’ll treat you to a healthy “power lunch” at the hidden gem Kaimana Farm Cafe. Utilizing local and organic ingredients, this is the perfect way to end your adventurous day!